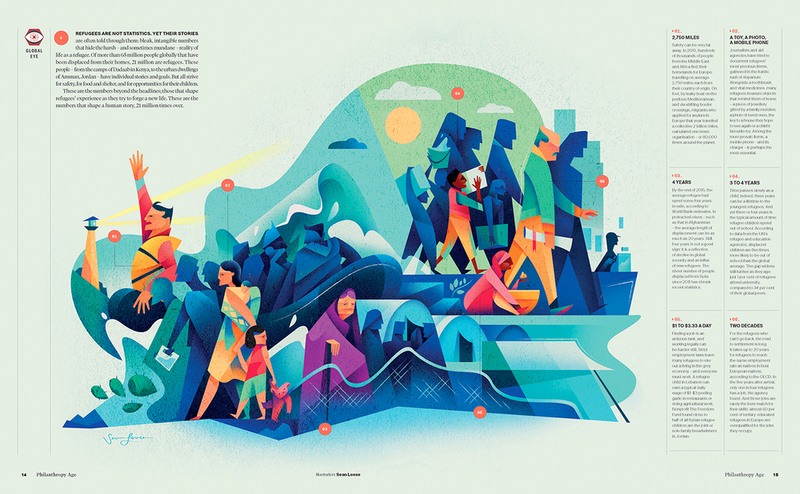 An illustrated infographic spread created for Philanthropy Age's Global Eye section. The editorial laid out statistics as they related to the trials and tribulations of refugees worldwide. "Safety can be very far away. In 2015, hundreds of thousands of people from the Middle East and Africa fled their homelands for Europe, travelling on average 2,750 miles each from their country of origin." "These people ... have individual stories and goals. But all strive for safety, for food and shelter, and for opportunities for their children."